The Daleks had been inextricably linked to the Doctor since his second adventure, which began broadcast on 21st December 1963. Their unusual appearance and distinctive speech made them stick in the public’s consciousness, and whist their mass appeal peaked twelve months after their début, the public’s fondness for them never went away. The Daleks had appeared at least once a year for Doctor Who‘s first four seasons before being rested for the following four seasons. But even during the time they weren’t being given adventures of their own, they had a past story repeated, they were featured in cameos, and they even had a full-blown appearance on another channel. The Daleks maintained their high profile during 1973 by guesting on television when the opportunity arose. For example, on 5th May 1973 (which was the night of transmission of the fifth episode of Planet of the Daleks) the evening started off with second series of Jimmy Saville’s entertainment/chat show Clunk-Click on which a Dalek prop was a guest star. The Daleks made regular public appearances around the country too, and it was whilst performing these PR duties that the props became a victim of their own notoriety as they were embroiled in real-life villainy. The final episode of Planet of the Daleks was broadcast on 12th May, after which the props had some refurbishment – including the fitting of new orange lights – before going out to Cardiff to do publicity. After returning from the Welsh event on 22nd May, the van driver unloaded Dalek Seven, whose component halves had been reunified, and Dalek Six-2. The driver became occupied elsewhere, and while the two props stood unguarded on the ring road outside Television Centre, person or persons unknown stole them from under the BBC’s nose. Panic ensued as the practical and financial repercussions of the theft were contemplated by the production team. Although seven new ‘Goons’ had been built for Planet of the Daleks, they were not designed to replaced the hero props, and the tenth anniversary would require lots of exposure. Not to mention the trouble caused for future television work. 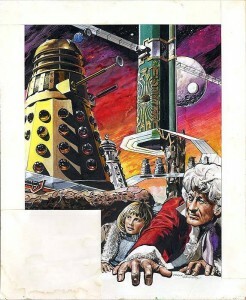 A plan of action was devised, and long-time friend of Doctor Who, Blue Peter, duly transmitted a special appeal for the return of the Daleks on 7th June. Taking a risk in explaining the worth of the casings, the magazine programme cited them as very valuable at some £500 each. The lone remaining Dalek One-5 was in studio to ask for the viewers’ help, complete with damaged neck. The surreal drama was short-lived, as both the missing props were recovered the very next day. Dalek Seven was found by a member of the public in East Dulwich, just hours after the appeal was broadcast. The alien casing was in a man’s front garden sharing the tarpaulin used for covering his car. Dalek Six-2 had been spirited across the City to turn up in Ealing, and was found by some nurses outside a set of garages. Dalek Six-2 (left) and Dalek Seven found! The ordeal may have been over but the props had not been well-treated by their kidnappers. Dalek Seven was in relatively good condition under the circumstances, but Dalek Six-2 had been very badly scratched and dented, and the fender had been broken. Despite their ordeal, The two props made an appearance on Blue Peter the following week to inform viewers they would not be exterminated, as they had helped to find the missing Daleks. 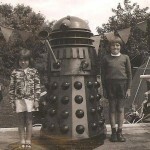 On the 23rd June 1973 Jon Pertwee and the Daleks attended the Trinity United Reform Church Fete in Heigham, Norwich. The fete was conceived on a grand scale as also appearing were “certain” members of Norwich City FC whom were an established Division One team. 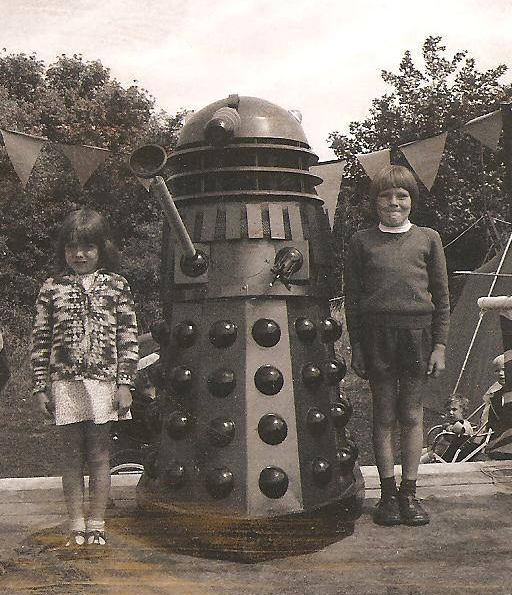 Shortly afterwards the Daleks were involved in filming for another children’s TV show. Vision On had been running since 1964 and was aimed primarily at children who were hard of hearing. The show featured the very popular artist Tony Hart, and also Sylvester McCoy. The Daleks appeared in a filmed segment which utilised the main three Shawcraft props and three of the Goon props – the usually-menacing aliens were depicted performing a dance routine set to music. The three Shawcraft props had undergone some refurbishment since appearing on Blue Peter. Much attention was paid to Dalek Six-2 which had suffered badly. The dome and eye mechanism received an overhaul after being smashed in its recent ordeal, this led to several small holes appearing around the rim of the dome and the eyestalk also had extra discs added. 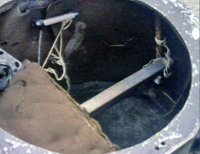 The fender had also been badly damaged and during repair was fitted with a rubber drape hanging from the underside (Dalek 7 and Dalek One-5 also received this modification). The neck rings were tidied by sanding down the affected areas giving a film like appearance from certain angles. Dalek One-5 also had its neck repaired (although a large split had appeared on the middle ring at the rear) and Dalek 7 had its lights returned to a clear type although it had lost eyediscs. The props were mixed for the dance leading to a combination of Dalek One-7, Dalek Six-5 and Dalek Seven-2 which now had the refurbished dome with the orange lights. The three Goons (which were now mixing as per the Shawcraft props) included the complete Goon iii (fitted with orange lights) and the upper section of Goon v.
The segment wasn’t transmitted until the following year in an episode concerning triangles. The publicity appearances continued for the props. Yet again they were out on the road at fetes and shows, such as the World of Leisure show. 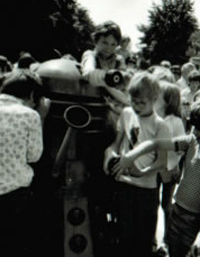 This took place at Hemel Hempstead in September 1973 and Dalek Six-5 appeared on the Prestonian Electronic Services stand. There is one prop that deserves a special mention because occupies a unique niche in Dalek Lore. 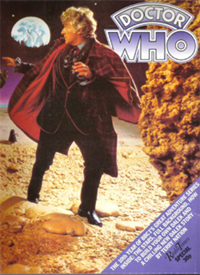 It is relatively well-recognised and yet as a ‘character’ it exists only in a limbo-state outside the canonical world of the Doctor Who television series. 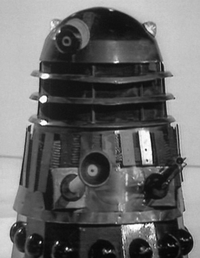 The prop in question, Dalek AaruII 9-11, has generally become known as the ‘Red Top Dalek‘. 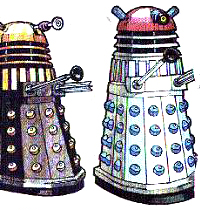 After the second Peter Cushing film, Terry Nation was given four of the Daleks which had been used. They were refurbished and repainted before being handed over, ending up as one red/black and three silver/blue props. They can be seen in this form in their television appearance on Whicker’s World in 1968. For an exhaustive explanation of the Dalek creator’s acquisitions you can find out which movie props they were and what happened to them on the Terry Nation Props Page, which also documents the birth of the Dalek Supreme from Planet of the Daleks. In due course, the components began to mix and the Daleks went on the road in a jumbled fashion with no regard to their colour scheme. In 1970 or 71, the repainting of some of the mismatched red set of components left an orphaned collection of variously coloured sections. The left-over’s included a red dome, silver shoulders and silver skirt which were all subsequently married up. 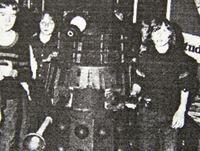 When Terry Nation was photographed at home in the autumn of 1973, part of his collection of Daleks was in attendance. The photographs were destined to appear in the November issue of the Radio Times as part of the commemorative issue for Doctor Who‘s tenth year. The photo-shoot also featured two of the new Westbury ‘Goon’ Daleks built by Cliff Culley’s team for Planet of the Daleks which had been broadcast earlier in the year. The Goons in question were not Nation’s own props, but merely drafted in for the occasion, to maintain continuity with the current look of the television props, a fact born out by their continued appearances in the television serials. In 1975, the legacy of the Radio Times photos continued in the form of collectors’ cards released with the Weetabix breakfast cereal. 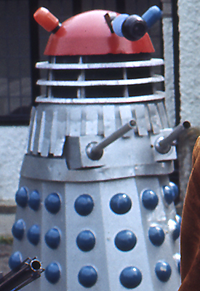 The irony was that at this point, the components of Nation’s props in real life had continued to be mixed and matched meaning the Red Top Dalek no longer existed. Just as the the red dome had been thoughtlessly swapped onto the silver shoulders and skirt, other combinations had been and gone, mixing the black, red and gold components. By the summer of 1975 even the famous Supreme which had been on television had had its skirt repainted black/red. 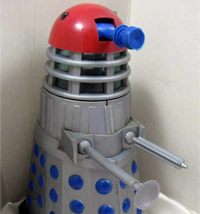 Two years after, Denys Fisher produced a six-inch tall Dalek toy and once again the ‘red top’ colour scheme was seen. This 1977 toy is now extremely collectable and remains another interesting appearance of the unofficial livery. Due to the dissemination of photos, and then its immortalisation in comics and in giveaway cards, the mythos around the Red Top Dalek became more significant than other random Dalek colour schemes outside the Doctor Who canon. 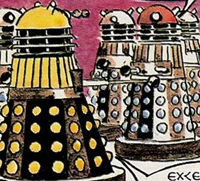 One of the most enduring consequences of the tenth anniversary of Doctor Who and the Daleks was the decision to draw up a set of plans for the Dalek props themselves which appeared in the November 1973 issue of the Radio Times. Whilst it must surely have happened before-hand, the idea of building a home-made Dalek prop was implanted into the mind of many fans at this point. 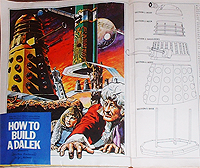 Before long, magazines and school fetes saw the fruits of the fans’ labours who followed the BBC’s official guidance on the best ways to go about making the components of the Daleks. Unfortunately, the plans were not accurate and the construction methods were often hard to follow. In the years that followed fan-made plans emerged, and after the creation of the internet, whole forums became devoted to sharing a passion which, if not begun in 1973, was at least fuelled by it. It had been an eventful year for the Daleks which included a brand new set of props, and also real life ‘run in’ with some genuine rogues. Despite all the drama, there was no let-up in activity, and it would only be a matter of weeks before the props would be called on again.